I guess that’s the best way to put it. My house had a peel. Now the new skin is growing back. Or maybe this stuff is just face cream, I don’t know. This stuff is called render, enduit (ahng-dwee) in French. Let’s stick with the French word. They spray it on and trowel it flat, the way they do stucco in the States. But instead of wire mesh, they spray it onto the stone, so the layer — this is the first of two — is very thick. I can sound pretty metaphysical, with all my references to what the house “wants.” In this case, it’s not metaphysical at all. 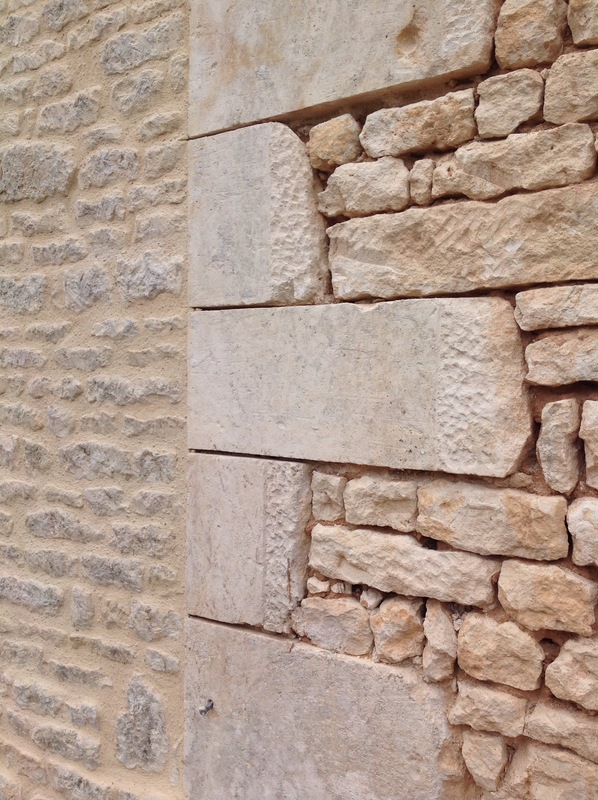 The builder’s intention is communicated in the stonework. This is your top of the line, gimme my enduit, stonework. 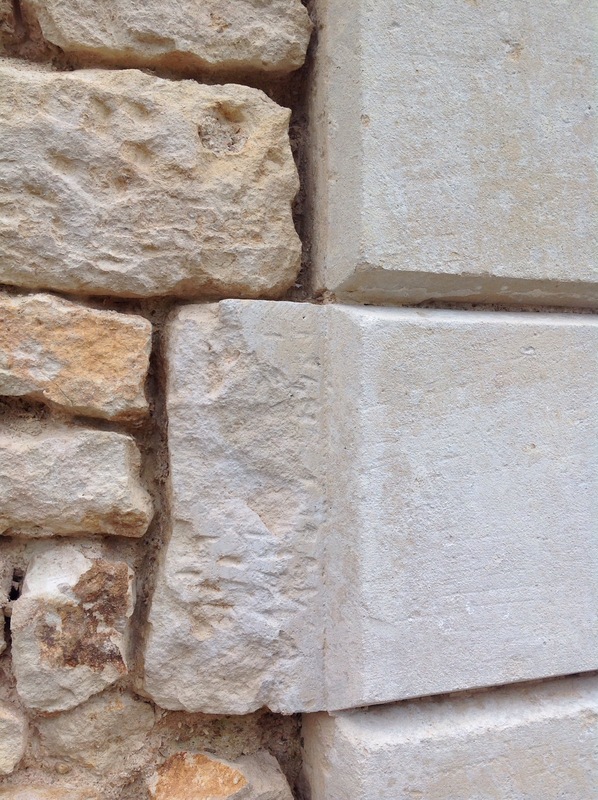 The corner stones are dressed, which is to say they are angled at the corners. They are chipped to allow good adherence to the enduit and the chipped parts are angled back to meet the stone that built the main house. If you are going to do something as insanely expensive as fix up a derelict old house, hope for a house built like this one. Chances are they didn’t cut corners elsewhere, either. Fortunately for me, the main body of my house was built in this way. And, well, then there is this. Some time later an owner wanted a more imposing look, so he added wings, little rooms that originally just stuck out there; I have changed things so that the rooms serve a function but originally, inside they just looked odd. Anyway, he wanted flash on the cheap, so he didn’t go to the trouble that the first guy did. You can see that the corner stones are just squared off. Though the ends are dressed to adhere to the enduit, they are placed nearly flush with the body of the house. In this situation, the crew will have to build out the enduit and feather it back to leave the corner stones exposed. It’s the knock-off handbag of stonework methods. So, if you are still with me, you are surely wondering why I refer to cornerstones, when those big blocks are in the center of the wall. And what’s going on to the left? Well, there was a third part, a second addition. They added a small apartment to the main house. To the addition to the main house. It’s solid enough but it is built more like a country cottage. These stones were not meant to be hidden. The crew packed the enduit around the stones and let it dry. Then they went over it with a wire brush to clean off the loose bits and make it look nice. There will be no second layer. And there you have it. The guys will do a first layer all around the house. They can do about one side of the house per day. Friday they will clear out. A friend is coming for her summer holidays, so I’m sure she will want to read that. When she and her family leave, the crew will return and give the whole place a second layer. And for I hope the next 50 years, that will be that. In 50 years, will the archaic skills needed to do this work still be passed on? I hope so — these buildings were meant to last — but you never know. 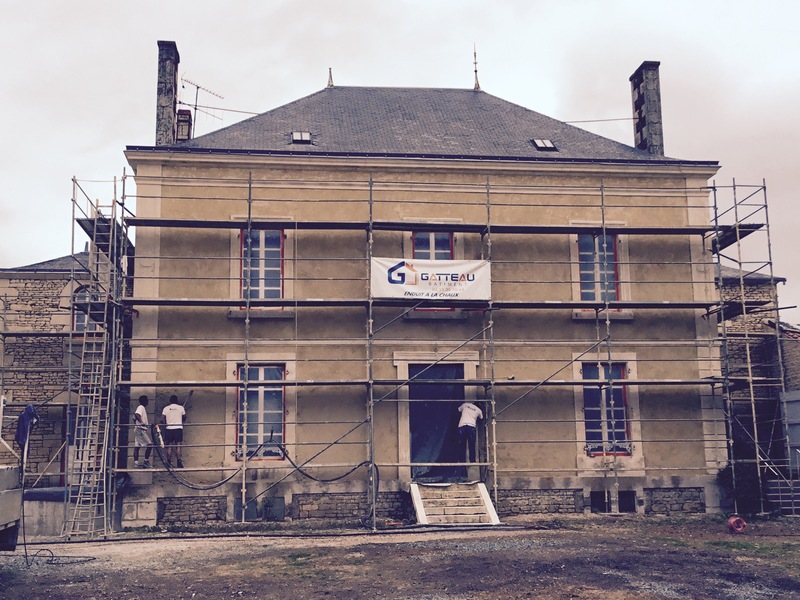 I was told that a house without crépi is “pas saine” because it will be full of humidity. The enduit is a protection. They knew what they were doing back then. I bet it’s nice and cool inside. Well, this is the space age version of a 19th century house. The insulation was literally developed for NASA, super effective and super thin, so we could retain the original moldings. Also it has underfloor heating, definitely an effective vapor barrier. But even without all that, the only damp issue I have had is along one wall in the basement. I have been lucky. But you put crépi on, right? Yes. To the extent possible it looks old but works like new. So, crépi outside, insulation inside. Stone floors with underfloor heating. Wood windows with thermopane glass. Lacanche cooker with an induction cooktop. At every decision point we tried to make it like that. Enduit. It’s quite a talking point in our village at the moment. There is an old Manor House right in the centre of the village, right next to the road. A year ago it was bought by a local builder and he has been completely renovating it, new roof, new windows and an entirely new facade. It used to be all exposed Charentais stone, now it is completely rendered. It looks handsome enough, but the locals are up in arms, they are furious that he was allowed to cover the fine stone. No doubt it will be argued for month, even years! Really? A structurally new facade or the old one covered up? Either way, didn’t he have to get a permit? How did he manage that? Did he have to match the old roof or windows? I might be with the locals on this one. Oh yes, you will see it. This is just the preliminary victory lap! So there is no way this could become the maison familiale? It would be way cool to grow up in a 13th century tower. As for the hard render — I assume you mean concrete where some sort of lime thing should have gone — that’s tough. I’m sure you have checked out all the National Trust and This Old House-type sites. I think there are places here where a previous owner did that. I think my crew are chipping it out using a sort of power chisel, like a small jackhammer. I’ll ask my contractor. Okay. After he had a good laugh, Kieron said to use a chipper. That is indeed the hand-held jackhammer thing I have seem them use. He laughed because his guys are skilled and will not damage the stone. If, say, you or I were to get out there, we could do a lot of damage. So, find the right guys and go for it. My contractor is Stuart Smith-Hutchon. His company is SSH Developpements. Is this the odd patch of cement or concrete inside? The front 2/3 of the downstairs are lime and the back third (was kitchen and bathroom will be kitchen) is concreted. where ? shall we take this offline ? Sure. You have both our email addresses. You kick it off. Sure – which email address? Or send me a blank and I’ll reply – I know you had issues with one of the accounts a while ago. Wow. That was a while ago. Can I send a blank? I’ll give it a try. Not at my house. I had whole walls covered in what had to be concrete — wrong color and not only not doing the job but holding water close to the wall. No better way to encourage damp and freeze/thaw issues. True. But frankly if it’s just the odd patch, or a bit on walls internal on both sides, then hacking it off can do more harm than good in my experience. Depends on the individual case. It’s the same with insulating to the point that there is no natural ventilation or air flow, which I have see cause issues also. Next Post Couleurs et Co.